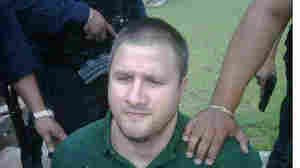 August 31, 2010  Mexico has captured Edgar Valdez Villarreal, an alleged drug trafficker known as "La Barbie." Valdez, 37, was born in Laredo, Texas, and has been battling for control in the Beltran Leyva cartel -- which lost its former boss, Arturo Beltran Leyva, in December 2009. NPR's Melissa Block talks to Jason Buch, a reporter at the San Antonio Express-News. August 31, 2010  Rescue workers in Chile have begun drilling a preliminary test hole into the solid rock. The plan is to make that hole about the size of bicycle tire. That would allow just enough space to hoist up the 33 miners one at a time. The rescue operation is expected to take months. August 30, 2010  The arrest of Edgar Valdez Villarreal, alias "the Barbie," was the culmination of a yearlong intelligence operation, the Public Safety Department said in a statement. The department said Valdez was captured Monday in the state of Mexico, which borders the capital of Mexico City. August 28, 2010  Rescue workers in Chile communicate with the 33 trapped miners via a narrow passageway carved through nearly half a mile of rock and soil. Relief supplies are sent down in narrow, 5-foot-long parcels nicknamed "doves." The doves also carry handwritten letters between the miners and their loved ones, who they may not see again for months. 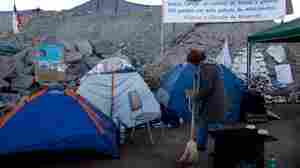 August 27, 2010  Thirty-three miners trapped for three weeks inside a mine in northern Chile were told Thursday it could take weeks to free them. To keep them healthy and sane in the meantime, activities are planned -- and they will soon get a chance to help drill themselves out. August 25, 2010  Officials say it could be the largest mass grave ever discovered in the country's deadly drug war. Marines found the bodies as they were investigating the shooting of a man who sought their help. 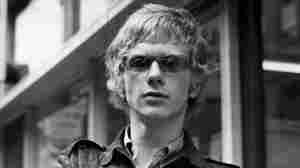 August 25, 2010  Andrew Loog Oldham was the first manager of The Rolling Stones. He created the band's bad-boy image, produced some of its first big hits and started Britain's first independent record label. Now, Oldham has emerged a world away in South America, where he's found a new life managing rock 'n' rollers en Espanol. August 24, 2010  In Brazil, broadcasters are barred by law from ridiculing any candidate in the run-up to an election. Advocates say the restrictions prevent unfair portrayals of the candidates, while critics say the ban threatens free speech. Over the weekend, a group of Brazilian humorists and their supporters held a protest rally. NPR's Robert Siegel talks to Jonathan Wheatley, Brazil correspondent for the Financial Times. August 24, 2010  Thirty-three miners found alive 17 days after a cave-in at a mine miles underground face the likelihood of staying there for several months as rescue operations are under way. Air is coming in through ventilation shafts, and engineers are sending them nutrition and medicine via plastic tubes.